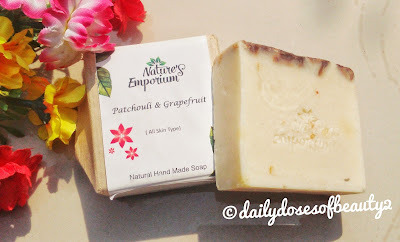 So, today review is about another product from Nature’s Emporium. I have reviewed their Lavender Lip Balm. If you haven't seen my review on that you can check it here . Now get to this one. So, this one is their Patchouli & Grapefruit Natural Handmade Soap. 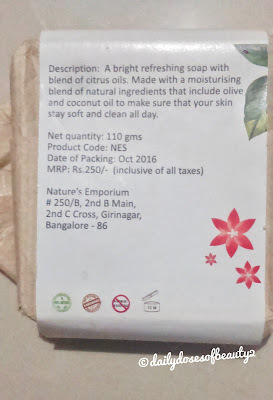 This soap is for all skin type. This is completely natural and handmade. They made their products in smaller batches so you will get fresh products every time . 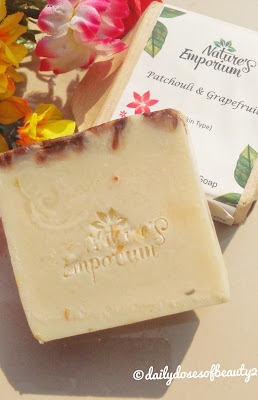 From Cold processed, handcrafted gourmet soaps, Shampoo Bars, Body butters, Natural Detergent bars, Detergent Powder, Luxurious Bath Salts, Face Serums, Lip Balms and many new products. I always love and encourage women entrepreneurs. It is great to see more women making their way into business on their own. Roopa is one of them who drives her passion through this business for Natural products. Some people are born with a passion and pursue it with all their might. But for some, like Roopa Honnaswamy, the calling came much later in life. A die-hard Bangalorean, Roopa was born into a loving family in Bangalore. Relentless pursuit of perfection was the lesson she was taught from a very young age by her father – a Police Officer. They are easily available on their facebook , Qtrove , Snapdeal , Amazon and other sites . A bright refreshing soap with a blend of Citrus oils. Made with a moisturising blend of natural ingredients that include olive and coconut oil to make sure that your skin stays soft and clean all day. Patchouli - Patchouli oil beyond its unique aroma has a wealth of benefits. Patchouli essential oil is said to help relieve anxiety and stress. Its calming effect is very effective for relaxation and meditation. Grapefruits - Grapefruits are delicious– they are a treat on their own and are a wonderful addition to any product. Grapefruit essential oil is popularly known as a detoxification agent. Grapefruit oil is often added to cosmetics to help treat acne and prevent oily skin. It comes in a environment friendly paper wrap which is recyclable. It gives a nice earthy feeling. Wrap is in brown colour with their name label and other necessary details written on it. 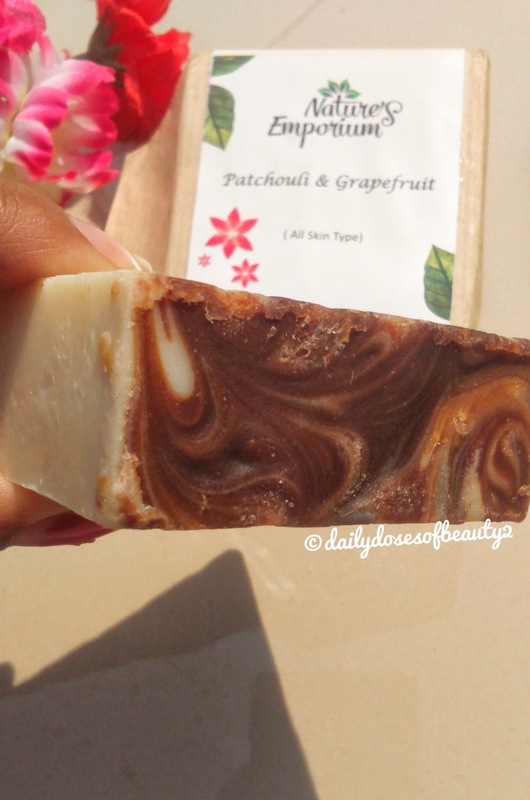 The soap bar comes in a combination of two colours cream and dark brown. It has Nature's Emporium engraved on it with a beautiful pattern on one side. It gives a luxurious look to the soap. 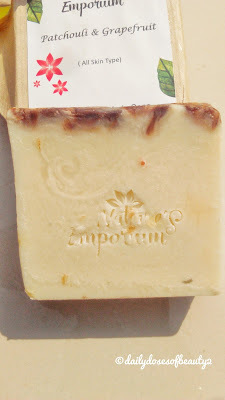 It has a fragrance of patchouli in it which i doesn't found too hard or soft. Although i have sensitive nose it doesn't irritate it . This is the first time i am using a product made of patchouli heard really good things about it. 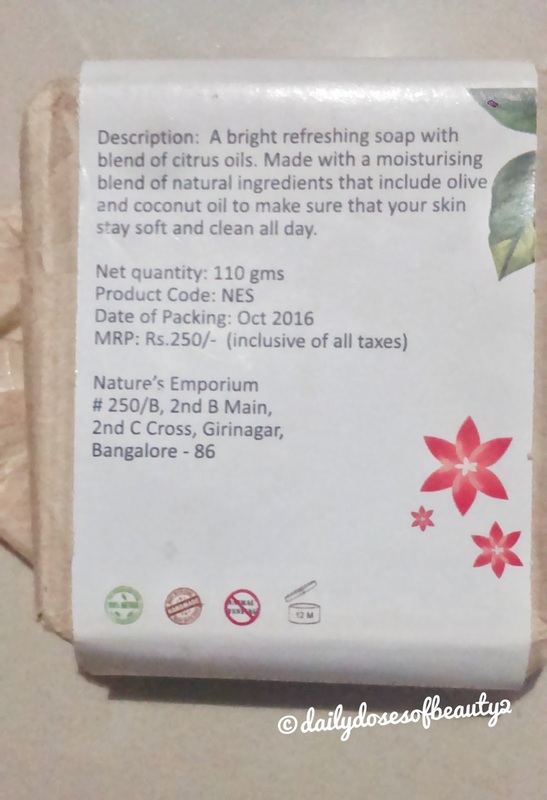 I mostly prefer shower gels in my bath compare to soaps but after the natural and cold pressed soaps started to make i thought to give it a try. I am glad i tried it. As it says it works on acne as well. I have tried it on both my face and body to give a fair review about it. Let's see how it pans out. I used it after a long tiring day at home cleaning my stuffs and some house hold duties. It cleanse my skin well and gives a fresh feel to it. 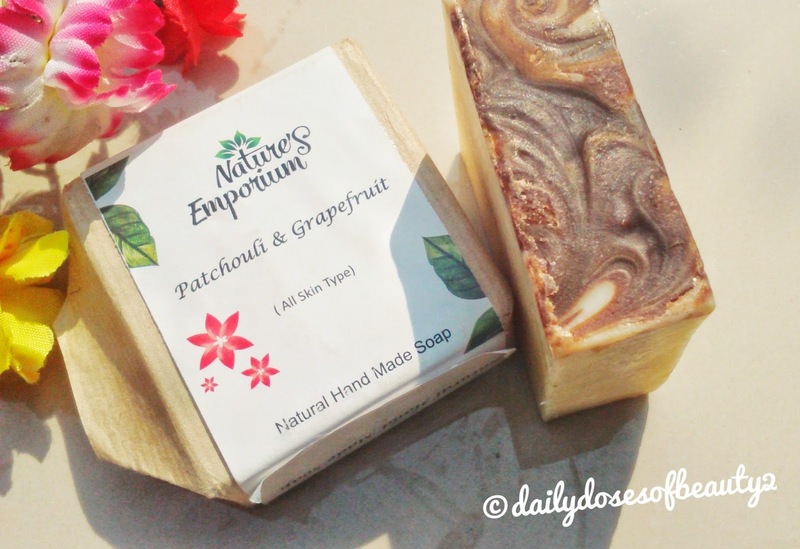 The fragrance of patchouli wakes you up. You can feel the clean and fresh skin. Moisturise your skin after bath to keep the nourishment locked in body. As it says it works on acne as well i used it for face. I have oily skin. It cleanse my face skin as well and gives a fresh feel to it. It removes all the oil from my skin. I don't have any acne ( touch wood) so can't tell exactly how much it removes or reduces it. But it surely deeply cleanse your skin. Don't forget to moisturise your skin. Final verdict - If you are a soap person or want to try something new give this a try. Cleanse skin well and fragrance gives you a wake up boost. Hola, That's all for today. Hope you like this review and found it helpful . Thank you so much for your kind words :-) Means a lot to me. Great natural product! I adore natural cosmetic! Great Product. Thanks for sharing this. Extremely important information. Thank you :-) Do give it a try. Ya..totally 😀 we need to encourage and support each other. 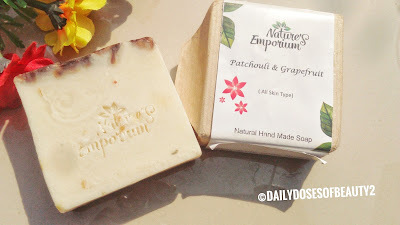 I came to know about Patchouli from this post. Thanks Neha! :) Well reviewed! Thank you sukanya :-) Do share your views after trying. Extremely informative . Love to try this . Thank you so much dear :-) Do share your experience after trying. Good review I always like anything that is natural and organic, thanks for sharing. Nice review! Though nowadays, body washes are gaining more popularity than soaps, I still like soaps personally. This product is all natural and potchouli oil is the USP of this product. I will definitely give it a try. This is really one of the good product I should give a try. And I like the looks though..it looks like yummy cake :-). Very nice review. Thank you for sharing. Now it s so easy decide if it matches my needs. What a detailed review. Just wow - bet it did wonders for you too! It's must try. Thanks for sharing. I don't think it's available on Amazon. Anyway, it looks good but for a non-soap person (read: me), it didn't appeal much to me.